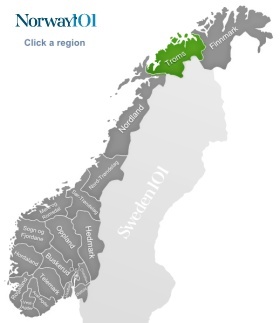 In Troms, you can find many places with the title “most Northerly” or “Northernmost”, as Troms is taking up much of Norway's North (but it is not the most Northerly region of Norway). Historically, the region was often overshadowed by its bigger and more powerful neighbors. As time went on, Tromsø, the main city in the region of Troms, became a more and more important center for trade and also a starting point for many Arctic expeditions. The region is known as one of the least polluted regions in Europe because its location is so far away from the bigger industrialized centers. You might be surprised about how fresh and clean the air in this place “smells”. People who visit Troms are never far away from mountains and beautiful landscapes, and it is best if you have your own car to explore the region. There are buses that go even to the smaller communities (but only once or twice a day), and there are good connections between the bigger towns, but to really see the beautiful spots, your own transport would be very recommended. This beautiful botanic garden is the most Northerly botanic garden you'll find in the whole world. The garden was opened in 1994, and has since then been very popular with visitors from Norway and international visitors (it is open from May to the beginning of October only). In this garden, you can see a wide variety of plants that grow in arctic and alpine regions, and of course you can also learn a lot about the different plants, especially when you decide to go on a guided tour. The short season of the garden has a lot to do with the weather in Norway: while you can get hundreds and hundreds of hours of sunshine in the summer months, it becomes dark for a very long time during winter, and snow is often the enemy of the gardener. If you visit the Arctic-Alpine Botanical garden, then you can also learn more about the challenges of growing things in this part of the world. 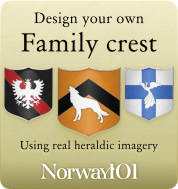 This living museum is located in Tromsø, and one of the places in Norway where you can learn about what life was like in the past. Living open-air museums are incredibly popular and numerous in Norway, but the Folkeparken in Tromsø is definitely one you shouldn't miss if you're in Tromsø anyway. The museum is not only a good way to put yourself in the shoes of the Norwegians' ancestors and examine their life, it is also located in one of the city's most popular excursion area. If you come at the right time, you can also take part in a free guided tour of the open museum. There is a cafe in an old storage house where you can have a short break and some refreshments. This is one of the vessels that used to take part in the hunting of seals. The motor vessel was built in 1949, and is one of the best preserved examples of boars from that time. Everything inside the boat and also above board is the original. The tools and original equipment are all still in place. You can see the original sailing rig and the smaller hunting boats. The MV Polstjema caught a total of around 97,000 seals during 33 hunting seasons. Hunting used to be a very important factor for the economy of this region in the past. However, the MS Polstjema also made some important arctic discoveries and by visiting the vessel, you can learn all about the history, the hunting, and the discoveries. If you are not too interested in the history of hunting vessels because you prefer living animals, then the polar park in Bardu is the ideal place for you. The park is fantastic and also provides plenty of space to the animals (there is a high priority on the animals' welfare). You can see all kinds of animals that live in Arctic regions like bears, wolverines, Arctic foxes and a lot more. There are guided tours, and sometimes you can also help with feeding the animals. Tromsø is a place you need to visit if you are interested in seeing some of the Northernmost churches of various creeds. The Arctic Cathedral is the church / building in Tromsø assumed to be the most photographed thing in the city. It has one of the largest glass mosaic windows in Norway. There is also the Tromsø Catholic Church from the year 1891, which is where the northernmost Catholic bishop has his seat. The Tromsø Lutheran Cathedral on the other hand is the world Northernmost protestant cathedral, and the only wooden cathedral in Norway.